One of our problems was that she kept creeping forward. Emily’s dogs stay tidily in their down position and daintily move only their paws. (And actually, so did my Zani, to whom I taught this behavior much more quickly). But Summer was perennially creeping forward or hurling herself after her moving paw and heaving sideways. Another favorite of hers was to correctly cross her paw over, then instantly remove the bottom paw and scoot one body width to the side. I reinforced that one way too much as well. My reasoning: Well, she is crossing her paw! I’ve said before that I had an epiphany about my dogs’ behaviors being a “map of reinforcement.” These outtakes show that in a microcosm. All these behaviors that Summer covers–and she is really good at variety–have gotten reinforced somewhere and somehow. You will see her target various parts of my body: my hand, foot, and leg. That’s because at some point I decided that if she was using the correct paw and reaching over the other one, it was OK if she targeted me a couple of times instead of the little coaster I was using. BIG mistake on my part. You’ll also see her enthusiastically whack with the wrong foot (that was not recently reinforced, but certainly has been before), and do a lot of general foot movement. You’ll even see her “give up” and put her head down on her paws. But as despondent as that looks, that’s actually an offered behavior as well. All the outtakes make for an amusing video (except that being targeted with extended nails hurts) but there’s a lesson here. If you don’t raise criteria fast enough and instead reinforce all these approximation behaviors too often, this is the kind of thing you get. I’m working on a couple posts about the Matching Law, but suffice it to say at this point that dwelling on intermediate steps and reinforcing approximate behaviors a lot means those behaviors are going to stick around. It will take that much longer to clean them out of the final behavior. This video doesn’t show me reinforcing Summer. That’s because I edited together a bunch of “mistakes” that I had finally stopped reinforcing. But don’t worry. My rate of reinforcement was generally very high. And when you think about it, that makes sense. It was high, and directed inappropriately a lot of the time. She wouldn’t be trying all this stuff otherwise. I have tons of footage of her doing it right and getting food reinforcers. But it made for a more entertaining video when I included only the bloopers. If you use a target for this behavior, it may be hard to fade. The dog is concentrating on hitting the target; the tactile sensation of crossing the paws (which is really what we want) is overshadowed. 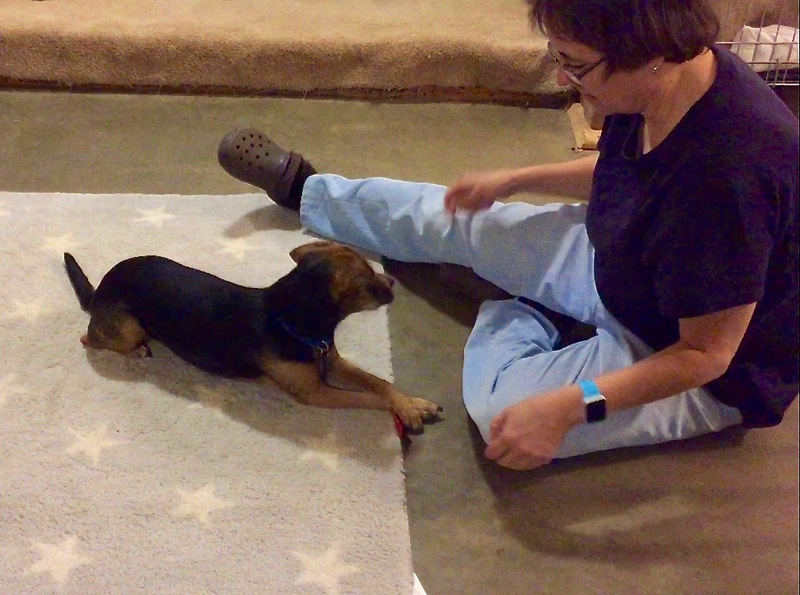 My friend Yvette Van Veen of Awesome Dogs suggests using a lightweight target (like a piece of paper) and actually putting it on the dog’s paw (the one that will end up on the bottom). Clever! What about the rest of you who trained this trick? What method did you use? How did the progression go? Using a Training Plan to Retrain Summer’s “Target” This is another example of my having reinforced a bunch of approximations and sloppy versions of a behavior. But then I cleaned it up. Welcome/Bloopers. My very first blog post with my original blooper video. « Why Do Dogs Eat Toilet Paper and Paper Products? That’s ingenious! Thanks for sharing, Isabelle!